Welcome to the 2015 Golf Preview, where I’ll take a look at selected golfers and examine what to expect over the next twelve months. Today, we end the series with a look at Rory McIlroy. From an early age, Rory McIlroy was planning on life as a golfer, even if he didn’t know it at the time. His father Gerry was a good player in his own right, playing off of scratch many years ago and it was his love of the game that got Rory started, as he would take his son to the local course in Holywood as often as he could, and even then, Rory wanted to go more often. Much like Tiger Woods, Rory would go to bed with a club in his hands, using the correct grip until he fell asleep. Rory swings at age 3. After an accomplished amateur career, which included a 61 at the age of 16 at Royal Portrush, Rory turned pro in 2007 at 18 years old and sixteen months later, had his first professional win at the 2009 Dubai Desert Classic. In addition to that win, Rory showed a stunning level of consistency that anyone would have been happy with, much less someone at such a young age. In 26 starts worldwide, Rory played in all four majors for the first time, missed just one cut, at the PLAYERS Championship, and posted twelve top-10 finishes while finishing second on the European Tour’s Order of Merit. In 2010, Rory won his first PGA Tour event at Quail Hollow with a final round 62, giving him a two year exemption and he also finished tied for third in the final two majors of the year, allowing him to crack the top-10 in the Official World Golf Rankings for the first time. As he entered the 2011 Masters, he was looked at as a favourite, which appeared to be justified after he fired an opening round 65, and carried a four shot lead into the final round, but an 80 on Sunday with a back nine 43, caused him to finish in a tie for 15th. Two months later though, he was able to grab that first major championship win, bulldozing the field at the U.S. Open to win by eight shots, which was the same gap he won by the following year at the PGA Championship, ending 2012 as the top ranked player in the world. 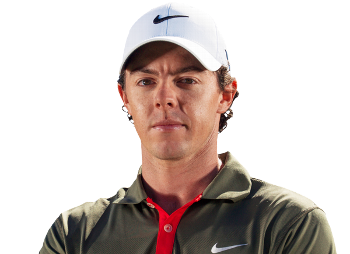 When 2013 rolled around, Rory new gear, leaving Titleist and inking a massive deal with Nike. Rory struggled for much of the year with the new ball and clubs, alternating between good and bad rounds on what felt like a daily basis before finally winning a tournament at the end of the year, defeating Adam Scott in Australia. It turned out to be a sign of things to come too, as Rory dominated golf in 2014, posting 17 top-10 finishes in 24 starts and four wins at big events: the BMW PGA at Wentworth, the Open Championship, the WGC-Bridgestone Invitational and the PGA Championship, giving Rory four major wins at just 25 years old. With most of these headshots, you can see some outdated apparel or a weird haircut, but none of that is present with Rory. He’s clean. Comparing anyone to Tiger Woods is a really, really bad idea but Rory is definitely the closest thing we’ve seen to the level of dominance that Tiger showed in the late 90’s and early 2000’s. He still has moments and rounds like any other golfer where he can’t seem to get it together, but those are so few and far between these days that I’m actually surprised when I see that he didn’t break par. As good as guys like Adam Scott, Jordan Spieth and Tiger are, the only one that can actually stop Rory is Rory. That right there is the quote of a confident and talented man, and the scary thing is that he’s right. For a long time, people have said that Rory is the future of golf, and that future is now. Rory’s stunning approach on 18, setting up the eagle. The shot I’ll always remember is the approach into the 18th green on Saturday evening, a laser through some gunmetal Liverpool firmament that was impossibly straight. The ball rocketed off Rory McIlroy’s 5-iron, a ridiculous club selection from 239 yards away, and never left the flagstick. There was no draw, no fade, no wobble or movement in the wind, no kick off a mound, no run and roll up off a slope. The ball flew straight. It bounced straight. What does Rory McIlroy do for an encore? Rory’s 2014 season was pretty much perfect, from his own individual efforts to the performance he put on to help Europe win the Ryder Cup at Gleneagles, and it’s hard to envision him doing anything that would actually top his last twelve months. He just needs to win the Masters to complete the career grand slam, and he’s talked about how that’s his main goal for 2015, and there’s no reason to believe that he can’t do that. His game translates well to any course in the world, but it’s a perfect fit for Augusta National where he can hit his baby draw miles from the tee and have it end up in just the right spot for one of those laser iron approaches. At this stage, it would be a disappointment if Rory didn’t win three or four tournaments and a major every year for the next decade. He really is that good, and at just 25 years old, we’re going to be watching him for a very long time. He’s going to win dozens of tournaments going forward, but us getting to watch him do it feels like the real victory.